Hi! 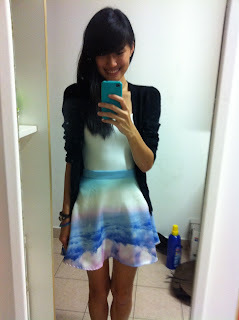 First time posting here after always reading reviews over here:D recently purchased the Morning Skies Printed Skirt from Lacepipe during their restocks. Really pretty prints and colours of the blue, pink and lilac hues blending over each other. However, the skirt has no inner lining tho, and is a little expensive in my opinion for a skirt without inner lining. Fits me well with a little allowance.